Students interested in learning more about Goldwater Scholarships and other prestigious awards should contact Megan Friddle in Emory's National Scholarships and Fellowships Program. For Emory College of Arts & Sciences sophomore Ashley Diaz, the motivation is simple: If she sees something that seems fun, she does it. That’s why she gave up swimming and soccer to take up boxing, and then became adept enough to move into mixed martial arts. It’s also the reason she left neurobiology research for a chemistry lab — where her excellent work and proposed project just earned her a 2018 Goldwater Scholarship, the nation’s premier undergraduate award in mathematics, natural sciences and engineering. Diaz was one of only 211 scholarships chosen from 1,280 applicants. Selected for their significant promise to be research leaders, Goldwater Scholars receive up to $7,500 per year while they earn their undergraduate degrees, to go toward the cost of tuition, fees, books and room and board. Most also propose or continue research projects. A Woodruff Scholar, Diaz plans to study how the compounds in surface-level disinfectants and antimicrobials — think Lysol sprays — cause bacterial resistance. 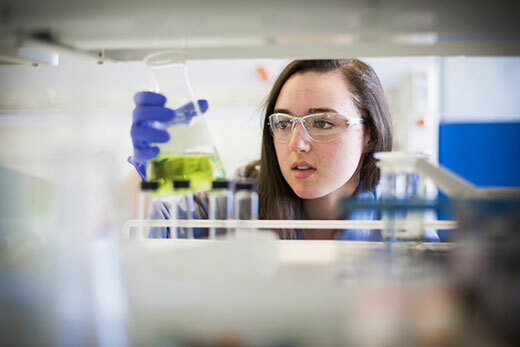 Diaz will rely on her previous biology experience for the work, while also using skills learned in professor Bill Wuest’s organic chemistry lab, which works to develop new ways to synthesize natural product-inspired molecules to understand bacterial processes such as resistance. Diaz will need to construct the compounds being tested and also combine her skills when testing them against resistant bacteria, whose genotype sequencing is being provided by Timothy Read, a microbial genomics expert and professor of infectious diseases at the Emory University School of Medicine. Actually, Diaz has published just one paper in a peer-reviewed journal so far, compared to Wuest’s three when he earned his doctorate. But she does have two more papers in preparation and has contributed to a textbook chapter on her previous research. Intensive research has long sounded like fun to Diaz. She was a Howard Hughes Medical Institute researcher in high school, studying the enzymes that flare after a spinal cord injury as part of the Miami Project to Cure Paralysis at the University of Miami. She co-authored a paper on the findings and also contributed to a textbook on that research, all during her first year at Emory. That work also helped her secure a rare first-year spot in a neurosurgery lab studying deep-brain stimulation to treat debilitating headaches caused by an inflamed nerve that runs from the top of the spine. She returned last summer to the University of Miami to work in the lab of neurological surgery professor Damien Pearse, studying the level of a specific protein in brain lesions belonging to patients with multiple sclerosis. But Diaz was already on her path to chemistry based on a recommendation from Tracy McGill, a senior lecturer in chemistry who had taught Diaz in 2016 in a pilot class for Emory’s new chemistry curriculum. Diaz, McGill knew, had embraced the interdisciplinary approach so much that she added chemistry to her neuroscience and behavioral biology major. When Wuest reached out about finding exceptional undergraduates for his lab, McGill thought Diaz was the perfect fit. Diaz, who has Cuban and Colombian heritage, has had the experience of being the only woman or ethnic minority in some research situations. That isn’t the case in the Wuest lab, whose diverse members heard about her Goldwater Scholarship just after Diaz did. She was busy building compounds when she got the news. In addition to her Goldwater project, Diaz continues her work in the Wuest lab under post-doctoral fellow Taylor Hari and graduate student Amy Solinski on their research to examine compounds that kill oral bacteria. The team synthesizes analogs in search of a compound that can destroy “bad” bacteria while allowing others to survive. “Chemistry is such an elegant science and an inventive way to solve problems,” Diaz says of her work building the analogs. Chemistry is fun, too, in other ways. Diaz will experience the discipline in Italy this summer, where her study abroad classes will include the chemistry of wine making and art restoration. She will have a few weeks at home between those courses and fall semester. The question is whether to study for the MCAT in order to pursue a joint MD/PhD, or take a brief respite on her way to a PhD.